Wisk together vinegar, honey, aminos & stevia. After cleaning the chicken wings, crush 4 cloves of garlic on them. Place wings in large sealable (Ziploc) bag. Throw the rosemary & rest of garlic in bag with chicken. Bake for about 25 mins or until the wings are dark brown with and a bit crispy. Notes: Aminos is a natural, healthy replacement for soy sauce. I didn’t have any brown sugar OR ANY SUGAR IN MY HOUSE!!! << I don’t know what’s up with that! I had these little packets of Stevia and I used 2 since stevia is soooo much sweeter than regular sugar. I do wanna try Agave nectar as a sweetener. This was done spur the moment, my brother, mom & dad absolutely loved the wings, But I feel I’m still not satisfied with them. I’m going to play around with the flavors and proportions next time…maybe add some red pepper flakes for a kick..who knows But I hope yall enjoy this nice healthy entrée..Have some stir fry or sauté some veggies to accompany these wings! 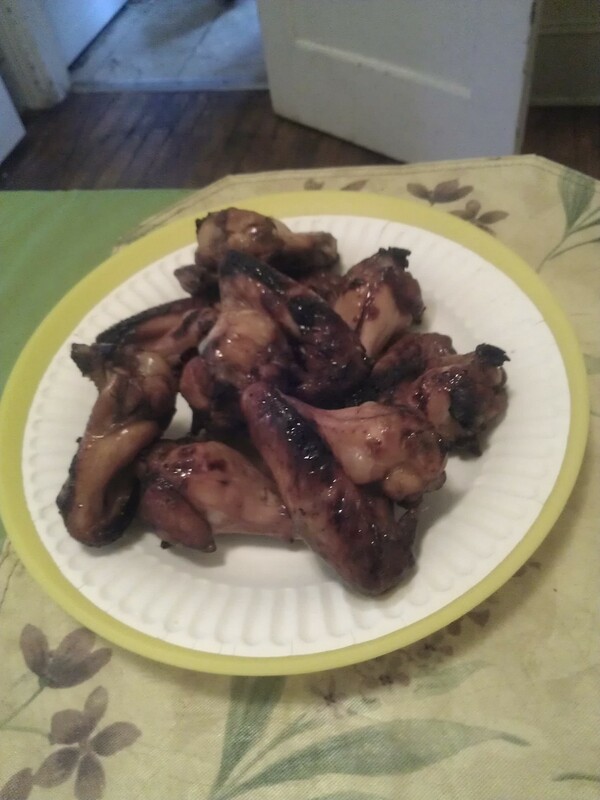 This entry was posted in Nutrition, Recipe and tagged chicken wings, dinner, healthy, honey balsamic on 04/21/2012 by The Tenth Muse.